A controversial portrait of the Virgin of Guadalupe wearing a floral bikini will remain on show after a US court refused to order a gallery to take it down. 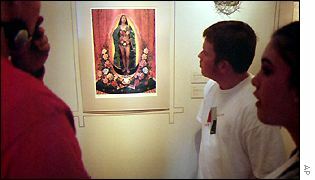 Protesters had said the digital image of Mexico's national representation of the Virgin Mary was offensive and insensitive after it went on show in Santa Fe, New Mexico, in February. But a judge has decided that the city's Museum of International Folk Art can keep the picture, by Mexican-born Alma Lopez, on its walls because of a legal technicality. The image will now be on view until the end of October - a date that was set as a compromise by the museum in May. Protesters took the museum to court because they said its decision to hang the piece and leave it up violated the state's open meetings laws. But State District Judge James Hall said the law required those who were offended to notify the venue that they had broken the laws before resorting to court action. And removing the piece would not be the right course of action even if the proper notice had been given, he said. The picture, called Our Lady, shows the icon with her hands on her hips and being supported by a bare-breasted angel. Some detractors had staged protests at Santa Fe's Museum of International Folk Art, saying the work was sacrilegious. The Most Rev Michael J Sheehan, archbishop of Santa Fe, said Ms Lopez had turned the Holy Virgin into a "tart". Ms Lopez defended her work, saying she intended Our Lady to show a strong and beautiful woman. "I see this woman's legs and her belly and [the angel's] breasts, and I don't see anything wrong," she told the Los Angeles Times newspaper in May. The Cyber Arte: Tradition Meets Technology exhibit, which includes the collage, was originally being due to continue until February 2002 but will now close on 28 October "in the spirit of reconciliation".